Recently I had the misfortune to go to Budapest while researching my forthcoming book The Cat’s Travelogue and I found it to be a tatty place, the buildings are much the same as all other parts of the ex Austro-Hungrarian Empire the plaster covering them is dropping at an alarming rate into the streets. Worst of all the people are not only tatty (they can’t help that can they?) they are the most miserable bunch of scuffers I have every had the misfortune to be scuffed at. 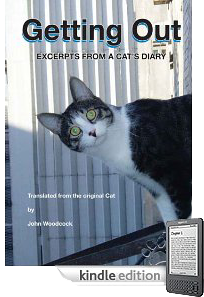 You can read more about Budapest in my new book ‘The Cat’s Travelogue’ because unlike China, India, Taiwan, Saudi Arabia and a whole host of other depressing and repressing countries Hungary couldn’t afford the ‘sponsorship’ required to keep their entry out of my very revealing travelogue – tee hee. 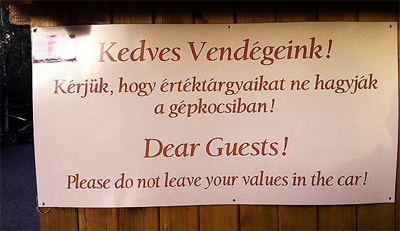 So with that in mind the sign on a Budapestian Restaurant car park was more than a little confusing as you can see! Don’t forget to get a copy of my latest unputdownable book and chase those financial blues away as you lose yourself in my world. I thought I would share a couple of photographs which I took when I was in Paris the other day. Etablissements Julien Aurouze, Paris is an odd little shop as you can see from the display in the window they sell Rat traps and all sorts of other things that snap and dispatch the furry kind such as gulp yours truly. 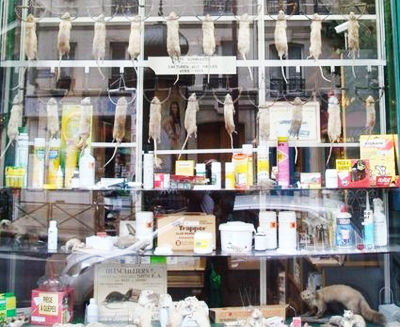 As you can see from their window display of far too many dead Rats the stuff they sell does seem to work all too well. 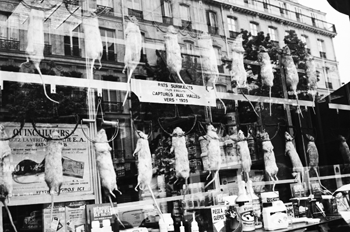 Mind you for those of you who are like me and have a delicate constitution to match their stomach I can tell you happily that the rats in the window are preserved Rats and have been on display since 1925. It’s a bit worrying that they look so fresh until you realise that Madam Tussaud was born in the neighbourhood and look what she has done to major and minor celebrities. Some say that the shop was featured in the Disney movie Ratatoullie maybe one of my clever readers could say whether that is true or not because of course I don’t watch movies about Rats or Dogs for that matter so I don’t know if that is the truth. 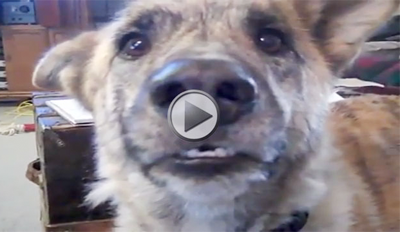 My dear lovely cuddly readers I am afraid that I have to insist that you watch the ‘Ultimate Dog Tease video which I have just put up on my www – wickedly wonderful website. To make it really very easy for you I have added a link that will whisk you to the correct page here Ultimate Dog Tease. This video is not only one of the funniest videos I have seen it makes even the hardest hearted Cat feel sorry for at least one dog in the world. 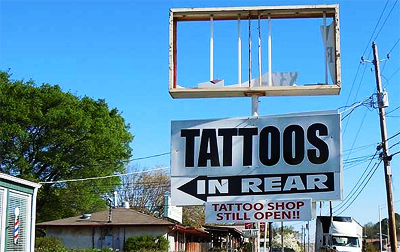 Signs sometimes don’t mean what they say but they can be a lot of fun all the same! Yesterday Was International Day for Street Children Did Anyone Notice? So yesterday April 12th was International Day for Street Children and I bet you didn’t notice! I have to say that I didn’t and sadly I rather think that the title ‘International Day for Street Children’ isn’t going to help it catch on in the public imagination or indeed be remembered – it isn’t like ‘President’s Day,”Thanksgiving’ or the dreaded ‘Tax Day’ is it? What made me sadder was the small amount of publicity about the ‘event’ and that it seemed to focus just on two cities full of street children because there are so many all over the world. The cities mentioned were no surprise to this Cat because he has visited both while writing his next book a ‘Travelogue’ they might surprise you though – well one anyway. 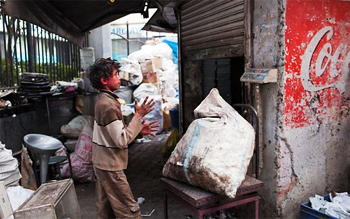 The first city featured in the ‘International Day for Street Children’ launch – this is the first International Day for Street Children actually – was the filthy slum called Delhi. Of course you are going to get street children and there is no point embarrassing Indians and speaking out loud about it because they not only have the ex-empire to blame instead of themselves they also have been net beneficiaries of enormous amounts of charity cash to help them sort out problems like street children and they haven’t managed yet. What was surprising was to see photographs, in the launch pack, of street children in Glasgow Scotland, part of Great Britain a country, which is supposed to be one of the most developed and prosperous countries on the planet who ‘graciously’ gives aid to China and India and other countries and is spending over 100 million pounds sterling on a royal wedding. What a silly little pompous country Great Britain is if it is more concerned about keeping up appearances than attending to the needs of its children! Now correct me if I am wrong but if the bride in the royal wedding just bought just one wedding dress instead of the three, yes three wedding dresses that she is supposed to have bought and gave the rest of the money to Glasgow’s street kids then they could probably have a few hot meals and if the dreadful royal family paid for the wedding instead of the british public then the 100 million or so which is being spent could do so much good. What is wrong with Great Britain and its royal family if they don’t understand that? 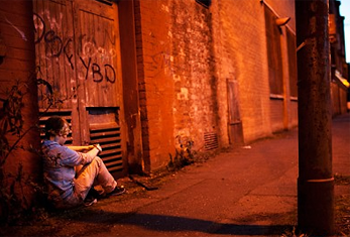 Maybe they don’t know that the once ‘great’ Britain has more poverty than Russia according to the CIA fact book! Lastly and I had to smile inwardly here, the organisers of the International Day for Street Children presented an expensively produced video of the kids in Delhi where as the poor kids in Glasgow only merited a slideshow! 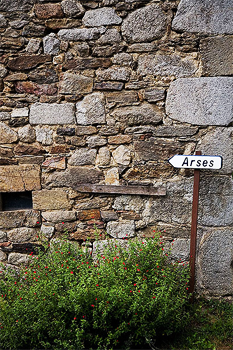 I saw this sign on my travels through France when I was doing research for my next book which is a Travelogue and will be the must have book for your holidays, the sign sort of sums the buggers up don’t you think? Don’t forget to look out for my latest book soon it will be on www.amazon.com all good webstores and in the lovely old fashioned brick one too oh and for all of you technophiles you will be able to buy my Travelogue as an ebook for any device at www.amazon.com or indeed my www.wickedly wonderful website here www.thecatsdiary.com. Of course you can buy my first book here Amazon.com or from my website now and really get ready for the next masterpiece.